HASLINGDEN SOLDIER REPORTED KILLED AFTER BEING SEVEN MONTHS MISSING. The sympathy of all will go out to Mrs. Roberts, of 19 George Street, Haslingden in the great loss she has sustained by the death in action of her only child, Rifleman George Wallace Roberts, aged 26, who served his apprenticeship to the painting trade under Mr. Hoyle and was a scholar at the Church Day School, afterwards attending the Parish Church. Missing since 24th August 1916, his mother's suspense was only ended last week-end by official news that he was killed on that date. 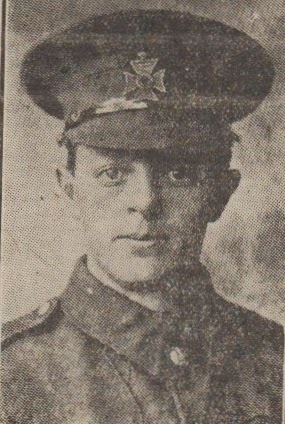 Deceased joined the Army on 24th January 1915, and had been at the front for 18 months. Following a short leave, he returned to France on 12 May last. In loving memory of my dear Son, Rifleman George Wallace Roberts, who was killed in action 24th August, 1915. Unknown by the world, he stands by my side.